Oh, how things can go so unusually wrong. 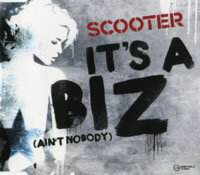 The album version of "It's A Biz" was a crazy electro-house track that maintained a very minimalist feel in the beginning, eventually building up to a pretty wild melody, manipulating a female voice to an extremely club-friendly beat. It completely went against the grain of anything Scooter had ever made in the past, but it was still easily the favourite of many from their 2011 polarizing album, The Big Mash Up. The single version is a completely different affair; to be honest, it feels like a much more rushed production and lacks the simple charm of its parent. First, we get the Big Mash Up Tour 2012 Edit, which starts us off with standard crowd chants, followed by the female vocals in a different pitch, backed by more squeaky house synths, leading to a lackluster melody (though the bassline's a bit bouncy, something I like about this track). Frontman H.P. Baxxter's rapping is back, but he doesn't sound quite as smooth or laidback as in the album version. He's more energetic, yes, but his words seem more forced this time around. When the female vocals return for a second round, a house piano tune is introduced, and it helps make the song more tolerable and less like a mismatched party track. But still, the production values seem generally lower, and the elements featured here tend to clash more than they harmonize. The Club Mix is a stringing along of all the parts featured above, although there are far fewer H.P. moments than before (as is the case with all Scooter club mixes). We can now focus more on that awesome bassline, which is the highlight of the song. The Extended Mix is what you expect: the complete song in its entirety, without anything particularly notable not already heard in the Tour Edit, save for some extra beats with which DJs can have some jolly fun.